Our Gu Zhu Zi Sun is made from only early spring buds and fresh leaves resulting in a fresh clean flavor and lingering sweet aftertaste. Take time to notice the tea leaves floating on the water similar to elegant Chinese orchids. Gu Zhu Zi Sun (Purple Bamboo Shoot) green tea is made by 72 year old female tea master, Pei Hong Feng. Initially this tea was steamed into cakes and then ground into a powder to drink. It was not until 1368 AD that this tea was brewed using whole leaves. The name “Gu Zhu” refers to the village name where the first tribute tea factory was made 785AD. The village is surrounded on three sides with mountains, but the east side is open, running down to the Tai Lake. This allows fog to roll over the village where this tea grows. The water there is very pure and they still use this water to brew their tea. “Zi Sun” translates to “purple bamboo shoot”. 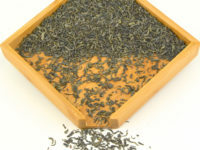 This tea was originally a shape very similar to Green Bamboo, hence the name. back to 1,200 years ago they would pick only tea buds, which resemble bamboo shoots. The picking standard changed to give it a much richer and smooth sweetness due to the addition of a leaf. Different dynasties emperor’s have their favorite teas, Tang dynasty favored Purple Bamboo Shoot. Lu Yu, the famous tea master, was instrumental in promoting tea and tea culture during the Tang Dynasty (619-907AD). In addition to writing the first book about tea, he built the first Tribute Tea factory for the emperor in Gu Zhu Mountain in Zhejiang Province in 846 AD. It was his belief that Gu Zhu Zi Sun was the very best tea, and became a Tribute Tea for over a thousand years. Lu Yu mentions that the tea’s soil should be grown with stones in it. Stones add minerals to help the tea taste better as well as filtering water and helping the soil breathe. When they would make this tea for the emperor each year, 30,000 people would be employed to make tea during early spring. There were a great number of tea gardens for work. There were at least 1,000 people who worked all year long to take care of the gardens, watch the factories, etc. A temple was built alongside the tribute tea factory, watched over by monks. Each year before tea picking, the local government would pray, eat vegetarian food for 5 days prior and bathe vigorously to honor the tea. Chinese believe that tea is a treasure from the gods, sent to earth to help people, and the first tea is the best. The first tea of the season would be sent to the center of China, Xi An, the capital in the Tang Dynasty. The tea must arrive before April 5th which is Qing Ming Festival where Chinese show respect to their ancestors and the king of the sky, thanking him for allowing spring to come, asking him to bless the coming harvests. A silver bottle of water Gu Zhu, as well as the first tea picking would be sent by the horse express. Horses would be changed often to make sure the tea got to the emperor before April 5th. It was the emperor’s favorite, wanting to use it to pray to his ancestors. The Gu Zhu Zi Sun tea bushes grow wild, they are not uniformly trimmed like commercial tea gardens. They let the tea bushes be. The bushes are surrounded by bamboo and other native trees, housing birds that eat the worms and bugs so they don’t have to use any pesticides. Falling bamboo leaves are used as natural fertilizer. The tea is picked about a week later than most high-end green teas, during the first week of April. Tea pickers carry small baskets around their waist and must wear rain proof clothing because the wild tea bush leaves have lots of water on them. Picking from the wild bushes is not an easy task, as the bushes vary so much in size and shape. Some bushes are very large, making it very difficult to reach all the leaves. The picking is done in the morning, while the processing is done in the afternoon. The picking standard is 1 bud: 1 tender leaf with a short sprig. After picking, they let the leaves wither for a couple hours to make them pliable enough for processing. Fresh leaves are very crispy and would break if you fried them right away. Both hands are used to fry this tea. The tea master will wear a glove on her right hand, and with her bare left hand she will check the temperature of the wok. This process is not like Bi Luo Chun or Dragon Well, this tea must be gently fried to preserve the puffy shape of the leaves. The tea is set to cool down to room temperature, usually taking a couple of hours. The tea is then roasted on top of bamboo drum holders above a charcoal pot to dry. They will make a fire first, then thickly clover with with ashes so there is no charcoal smell. The temperature is kept very low and the windows and doors are kept open, so there will not be any charcoal aroma on the finished tea. The tea will be roasted slowly for at least 2-3 hours. This is to move out most of the moisture so the tea’s quality will remain for longer. If you don’t dry it enough, the tea will get old very quickly. The freshness from bamboo forest is present in this tea. There is a light macadamia nut taste with a lightly sweet wild flower aroma. The sweetness is mild and soft that builds on the sides of your mouth very quickly. Mrs. Pei Hong Feng is 74 years old (2014). She picks tea and supervises picking in the morning and fries tea in the late afternoon. Tea pickers are Mrs. Pei's elderly neightbors, who are happy to have a job not far from home. Tea master Mrs. Pei Hong Feng teaching how to pick tea the right way. 2014 Tea tour visited this organically grown tea garden, but the farmer cannot afford to apply for the organic certification. Fresh leaves breathing after they are brought back from the tea field. Bamboo tray for final roasting with charcoal. Traditional handmade tea are pan fried then roasted with charcoal on top of bamboo trays. Infusion: First infusion at least 2 minutes. The leaves are good for 5 infusions. Add a little more time for each subsequent infusion.